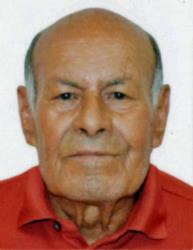 Luís “Louie” Araiza, entered eternal rest on June 7, 2018 surrounded by family. He was born on June 6, 1935 in the City of Venustiano Carranza, Jalisco, Mexico to Cruz and Aurelia (Gomez) Araiza. He became a U.S. citizen in 1975 and began his electrical business, “Hot Springs Electric” and later expanded to include plumbing and mechanical as “Arrow Enterprise”. Luís is fondly remembered for his technique of licking his fingers and touching electrical wires to see if they had current. Luís grew up in Juarez, Mexico where he shined shoes since the age of six. As a young man, he apprenticed in radio repair and neon signs. Some of his work can still be seen in T. or C.
He was preceded in death by his parents, Cruz and Aurelia (Gomez) Araiza; brothers – Juan and Jose Araiza of California; and in 2003, his wife of 40 years, Teresa Martinez Araiza. Survivors include his three daughters and 2 sons from his marriage to Teresa – Martha Romero, Teresa Oblinger, Consuelo (Daniel) Griego, Ric (Renee) Araiza and Diego (Lucy) Araiza; 15/grandchildren; and 12/great-grandchildren; sisters, Mercedes Guillen and Felicitas Martinez; and current wife, Isidra; and her children – Aracely, Antonio, Oswaldo and Dulce. Cremation has taken place and a Rosary Vigil will be held on Thursday, June 14, 2018, at 7:00 P.M. at Our Lady of Perpetual Help Catholic Church led by Deacon Jim Winder. A Memorial Mass will be held on Friday, June 15, 2018 at 11:00 A.M. celebrated by Rev. Marco O. Reyna. Inurnment will follow at Vista Memory Gardens Cemetery. The staff of Kirikos Family Funeral Home, Inc. will keep you and your family in our prayers. We thank you for allowing us to assist you in your time of need. We're sorry to hear about your recent loss. May you find strength from the words of Philippians 4:13 which says: "For all things I have the strength through the one who gives me power." What a loving God who cares about each one of us. He didn't intend for us to grow old and die. He thus has made the SURE promise of a resurrection right here on earth when it is restored to a beautiful paradise (Psalms 37:9-11, 29; Acts 24:15; Isaiah 55;11). Can you see yourself welcoming back to life your loved ones? What a joy it will bring all of us. You can go online to JW.ORG and find out more about this resurrection. Lo siento mucho que están pasendo momentos muy difíciles. Esperó que las palabras de Salmos 46:1 puede dar a ustedes fuerza que se necesita. Dice : "Dios es para nosotros refugio y fuerza, una ayuda que puede hallarse prontamente durante angustias." Que bondadoso esta nuestro Dios. También, el ha hecho la promesa que va a haber una resurección aquí en la tierra cuando sea transformado en un paraíso! (Salmos 37:9-11, 29; Hechos 24:15). Eso no es sólo un sueño, pero algo muy cierto, porque Isaias 55:11 nos asegura que todo lo que Dios dice, se cumple sin falta. Que gozo será de dar las bienvenida a nuestro ser querido que han durmiendo en la muerte (Juan 11:11) Ve en línea a JW.ORG/ES para encontrar más información sobre éste resurrección.